BBC: South Korea’s capital Seoul has seen its first ever deaf taxi drivers take to the road this week, thanks to new software that’s been launched to help reduce the local stigma of hiring hearing-impaired people, it’s reported. 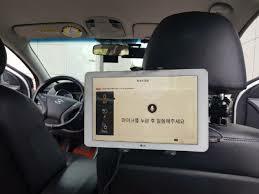 According to the Korean Times news website, two deaf taxi drivers began transporting passengers around the city this week, aided by software developed by the local Coactus start-up.Describing how it works, the Yonhap News Agency says that dual tablets have been installed in the front and back seat of taxis, which is linked to the firm’s “Goyohan Taxi” or “Silent Taxi” app.The app includes voice-to-text conversion, and enables passengers to specify both destination and preferred drop-off point, as well as their payment method of choice. It was developed by a group of students in the city, led by computer engineering graduate Song Min-pyo.